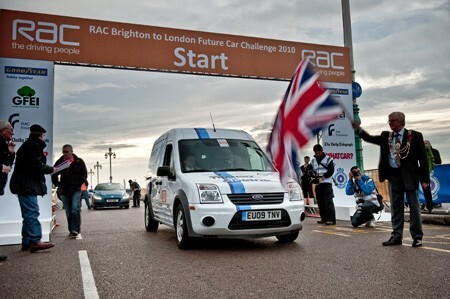 OK, saying we won the whole challenge is stretching it a bit, but a Fiesta Econetic driven by Jay Nagley of Autoblog UK and Paul Barker of BusinessCar won its class for the best fuel consumption of the Future Car Challenge run from Brighton to London. This was the inaugural event to showcase the latest in low-emissions car technology, whether it is electric, hybrid or conventional petrol or diesel engines. The Fiesta's fuel consumption for the 64 mile route was 78.6 mpg, achieved on a route deliberately chosen to make life as difficult as possible. Rather than using the A23 and M23, the route snaked through every town and village on the route and hit London on Saturday lunchtime, just as half the city seemed to be on the road to get their weekly shop/go to the football/see friends and family. Of course, the Challenge also included cars a bit more radical than a Fiesta Econetic. 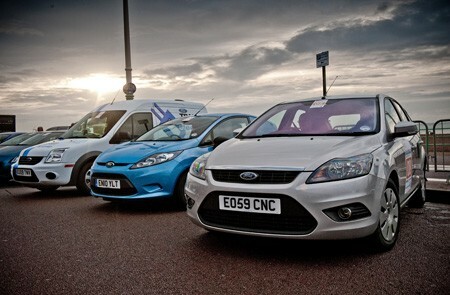 The Autoblog UK team also drove the electric Transit Connect, which will be Ford's first production electric vehicle when it goes on sale at the end of 2011. It made the run with a quarter of its charge left, suggesting an everyday range of around 80 miles – fairly typical for a modern electric car. 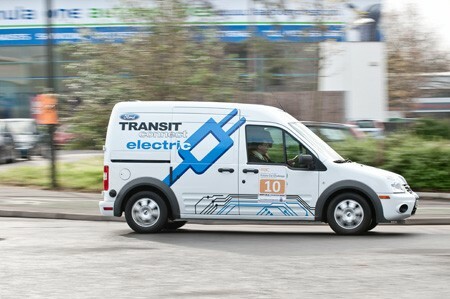 The Transit Connect was notable mainly for the fact it has smoother acceleration from rest than any petrol-powered car, even something like a Jaguar. The rapid, silent acceleration seemed especially out of place in a goods vehicle but will be very welcome to White Van Man. He'd better wrap up though in the winter – apparently one of the most important influences on range is how much you use the electric heater. Pretty well every serious manufacturer had vehicles on the run, from the Tesla electric sports car through the Honda FCX Clarity fuel cell car to the Vauxhall Ampera with its 40 mile electric range backed up by a range-extending petrol engine. The run ended with a rally in Regent Street, with the future cars back-to-back with the Veteran cars about to set off in the opposite direction for the traditional London to Brighton run – a nice touch. The public seemed very interested in the future cars, many of which will be going on sale in the next couple of years, so it may well happen again next year.